After the highly successful remake of the original classic Giana Sisters game, Twisted Dreams was everything I had hoped it to be and more. So when I heard about Giana Sisters: Dream Runners I was giddy with excitement. The premise behind Giana Sisters: Dream Runners is simple; get far enough head of your opponents to push them off the screen. 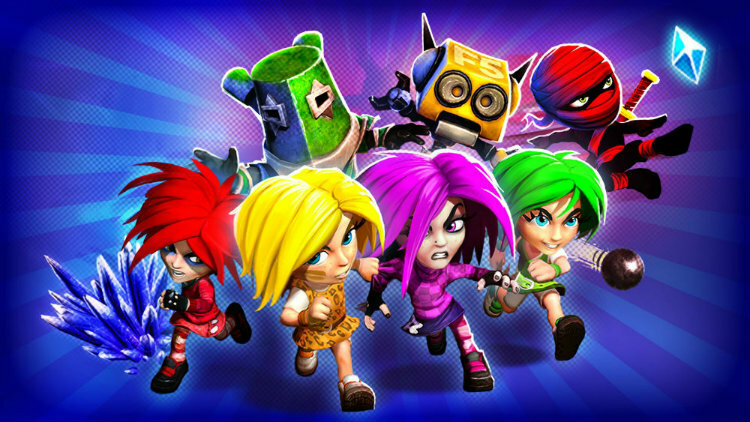 With up to four players (or AI opponents), you will run, dash, jump, collect power ups, and smash your way across nine levels of pure multi-player mayhem. Does Giana Sisters: Dream Runners offer the same challenging and fast-paced action that made Giana Sisters: Twisted Dreams so fun? Let’s dive into Giana Sisters: Dream Runners and find out. One of the first things that you will notice about Giana Sisters: Dream Runners is its bright, colourful, and charming graphics. As you race at breakneck speeds, you’ll be amazed at the little details the Black Forest Games has included in this value priced game. From flowers swaying in the wind, rocks crumbling at your feet, to the superbly animated backgrounds you will be amazed. Playing with up to three other friends on your living room couch is fun. With dream gates scattered throughout the levels that prompt environmental shifts that are designed to confuse or slow down your rivals, you will be hooting and hollering at each other with delight. 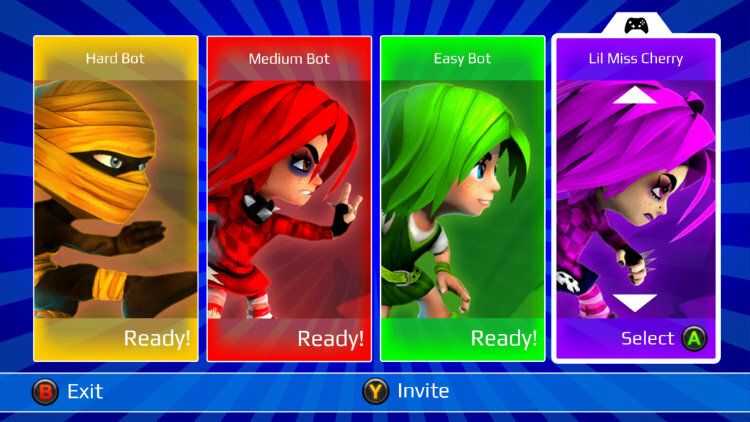 Sadly, when playing Giana Sisters: Dream Runners it doesn’t matter which character you choose. The relativity small selection of characters control the same as one another. 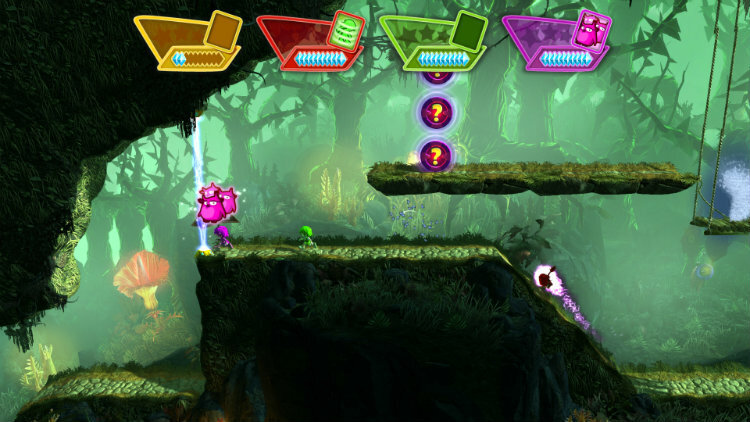 In turn, it leaves little to no desire to unlock any of the four additional characters that are included with the game. With multilayer being a big part of the game’s appeal, the online community is almost non-existent. I was only able to find one online game to join after 60 minutes of searching, and got disconnected within the first few minutes. It’s a shame that there are not more people playing online—playing against the AI is nowhere near as fun as playing with friends and family. Occasionally, I encountered a strange issue where it seemed as if my character had a mind of their own. It wasn’t uncommon to find my character stuck on screen when trying to jump up and get an object, and to make matters worse if I was able to free my character it would then slide and float around the environment obscurely—it was if I wasn’t even controlling my character. These little bugs can certainly be frustrating. For its value price, Giana Sisters: Dream Runners looks fantastic, and I applaud Black Forest Games for what they tried to accomplish with the game. I really wanted Giana Sisters: Dream Runners to be as successful as its predecessor; however, it unfortunately falls short. With an online community that is non-existent, your only choices are to play against AI or with family and friends. Nevertheless, if you are ok with local multi-player only, you should try the game. However, if you are looking for an online experience with this game, you will be sadly disappointed.